Ask fellow campers about "Newton Hills State Park" and nearby attractions. This is a state park and we were not in state so the rate reflects a surcharge for that and the access fee as well. This is a gem of a park. Electric only but lots of space between units lots of trees and grass. 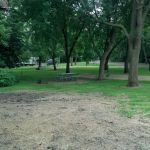 Picnic table and fire ring are at each site and they were full up. We got the last site for the weekend. Not a lot around there but we were meeting friends so we were ok. Lots of areas to hike as well. 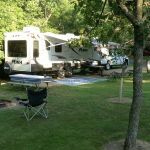 We camped at Newton Hills State Park in a Motorhome. Some of the sites were facing the wrong way so you have to go a long way around to back in. Nice quiet area with spacious sites. Lots of hiking biking trails and roads. Pretty remote - Verizon cell phone signal weak, but it worked. Local TV stations available and satellite in some sites between trees. No water or sewer but good dump station. We camped at Newton Hills State Park in a Motorhome. Are you affiliated with Newton Hills State Park ?